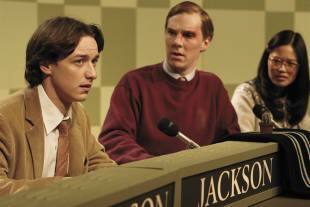 Who would have believed that University Challenge could provide the central plot hook for a sweet romantic comedy? The long-running BBC quiz show has been parodied before on the small screen - remember that classic episode of The Young Ones featuring ‘Scumbag College’? - but now it makes the unlikely leap to the big screen in the unoriginal but amiable comedy Starter for Ten. In adapting his own successful novel, screenwriter David Nicholls places the programme at the climax of a story which hits all of the requisite rom-com beats with a thudding predictability; but the film manages to carry off the clichés of the genre with a sense of humour and understated charm which is ultimately hard to resist. “Ever since I can remember I’ve wanted to be clever” says working-class Essex boy Brian (James McAvoy), sounding like a nerdier version of Goodfellas’ Ray Liotta, at the start of the film. He avidly watches University Challenge as a child and throughout his adolescence he continues to devour every piece of information he can find, until he finally achieves his dream in 1985 when he is accepted at Bristol University. After a brief settling in period, Brian joins the University Challenge team which is being chaired by the pompous Patrick (Benedict Cumberbatch), and he instantly falls for one of his team mates; flirty blonde bombshell Alice (Alice Eve). But does his future really lie with her, or is he missing the chance of true love with his down-to-earth political activist friend Rebecca (Rebecca Hall)? You don’t have to be a University graduate to figure out where Starter for Ten’s story is going - indeed, most of the major plot points can be easily predicted about an hour before they occur - but the film still contains plenty to enjoy. Chief among its pleasures is the perfect cast, all of whom give convincing, heartfelt and intelligent performances which imbue their characters with depth. 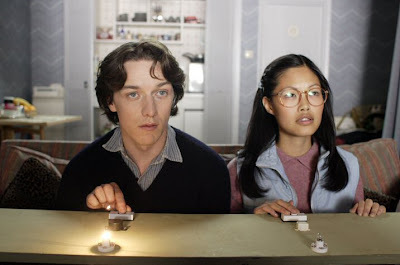 As the gauche know-it-all Brian, James McAvoy gives a wonderful turn, full of warmth, and his strong display holds the attention even if a number of the situations Brian finds himself in are trite. McAvoy handles the comical slapstick scenes with aplomb and he brings a surprising amount of emotion to his role; the scene in which he comes close to tears when talking about his dead father could have been horribly mawkish, but McAvoy makes it genuinely affecting. The young actors who make up the supporting cast all pull their weight too. Eve and Hall excel as the two women in Brian’s life, both ensuring their ‘love interest’ roles grow into something considerably more substantial, and Cumberbatch effectively indulges in a spot of broad comedy as the toffee-nosed Patrick. TV comedienne Catherine Tate makes a convincing bid to be taken seriously as an actress with her performance as Brian’s mother, a funny turn which has a nice touch of pathos about it; but the really remarkable performance in Starter for Ten comes from League of Gentlemen star Mark Gatiss, who inhabits the role of Bamber Gascoigne with startling accuracy. Buried under a large pair of glasses and a thick wig, Gatiss looks unerringly like the venerable presenter, and he perfectly replicates his voice and mannerisms too. His hilariously on-the-nose portrayal plays a big part in enlivening the film’s third act. Starter for Ten director Tom Vaughan is making his feature debut with this film after learning the ropes on TV dramas such as the BBC production He Knew He Was Right and ITV's Cold Feet, but his handling of matters here is anonymous. The blandly generic cinematography makes the film looks like any other British romantic comedy, and the soundtrack is comprised of all the expected late 70's/early 80's hits. In fact, the only times Starter for Ten exhibits any signs of being directed at all is when the film seems to have been over directed. Vaughan's unoriginal eye occasionally slips into cliché mode, with Brian making two long runs towards the object of his affection (one in the pouring rain, naturally), and his clumsy handling of a naked Charles Dance and Lindsay Duncan blows the A Fish Called Wanda-style set-piece at the film's centre. Vaughan could certainly have used a lighter touch in his direction of Starter for Ten, but the neat screenplay by David Nicholls comes through unscathed. Aside from a few mild stabs at Britain’s class system, Nicholls generally focuses his attention on his characters, and he generously doles out some witty dialogue for most of them along the way. The structure of his script is, admittedly, resolutely formulaic, but there’s little wrong with adhering to a formula when it’s done to a high standard, and Nicholls hits the mark more often than not. There’s even a smart plot reversal during the climactic game show which took me unawares and cast an unexpected slant on the subsequent scenes; Starter for Ten may only have one surprise up its sleeve, but it uses it well.